This is part two, if you missed the first part please go back and read part one. You can find it by clicking here. I ended that post with the question, So what do we do then? Well, I most certainly read and understand the different brands of homeschooling and yes even try them out from time to time or at least parts of them but in the end I always come back to doing what works. At times some of what we've tried does work and some of those trials we still use in our home today. Yes, I simply just do what works and continue to do what works until it stops working. That is the absolute beauty of this thing we call homeschooling. We truly are captains of our ship, we absolutely choose which type of boat and which pieces of various boats we like best and want for us. I fear so many of us get caught up in the doing of things the right way only to lose track of what is truly important....... our children, our family environment, our home life, our sanity and our connections with each other. Those are the things that matter the most not whether I can say that I am indeed doing nature study as Ms Mason instructed me to do so. Or that yes I am absolutely ensuring that I create an abundance of self service engaging activities for my children, as Maria Montessori recommends. I often wonder if many of us fall into these prescribed brands of homeschooling out of fear. Fear that we aren't enough on our own, fear that if we don't follow a tribe we will be left out or in some way will harm our children. Fear that the 'Jones' family appears as though they have this wonderous thing going on that I want for my family and so I really must do what they appear to be doing. Fear, when we allow it to take hold, is suffocating. It's back breaking, wall building, anxiety increasing, heart breaking. We must allow ourselves to break free from that fear and to truly choose the best options for us, our children and our family unit. Now there are elements of all of those things I have listed that we do indeed undertake here in our home, because they work for us, but we do them in a way that does indeed work for us. If you have found a prescribed way of doing something and found that it works for your family then that is truly wonderful, it really is and I am so happy that you have found your comfortable place. But if you have tried a myriad of prescribed 'brands' of do this and do that and nothing really seems to fit perfectly. If you find your self doing bits and pieces of everything out there. If you are what I call an, ordinary everyday homeschooler, just like me then take heart because you are not alone. I know that there are so many of you out there that are most likely right this very moment trying your hardest to fit in to that perfect group of homeschoolers that appear to fit that perfect homeschooling brand. I want to let you know that it truly is ok to simply let it go. All of it, just let it go. 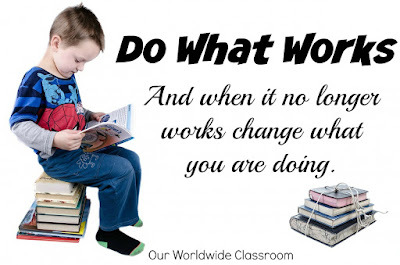 Take the time to look at what you are doing on a daily basis, is it bringing joy to your homeschool day, that is to both you and your children? Or is it simply another draining exercise that you must tick off the list because it is part of your desired homeschool brand? You can do this without the 'must have homeschoolong brand' truly you can! You don't need to align yourself with any of these must have notions. 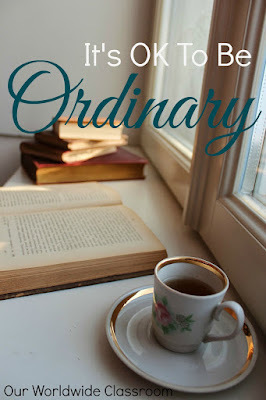 It really is ok to simply be an ordinary everyday homeschooler. Let's support one another with this ordinary everyday homeschooler thing. If this is you? If you simply do your thing or if you are striving to get to that place where you are comfortable doing what it is you do without the need for reassurance from other well meaning homeschoolers then we want to hear from you. We can be united in the fact that each and every one of us simply does this homeschooling thing in our own very unique ways. Comment below and let others know that you too are proud to be an "Ordinary Everyday Homeschooler"
Thank you! i have been struggling so much to put together curriculum that would meet other standards than figuring out what will actually work for us. Thank you for your words that have touched my heart and made me stop to think!